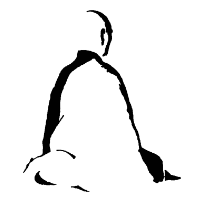 "Zen simply means sitting. In Japanese they have the full word, 'zazen'. It means sitting silently, doing nothing. All doing is of the mind. Whenever you do, the mind comes into being. Whenever you want to do something, the mind immediately starts planning. With even the idea of doing you start pouring energy into the mind. Zen is a simple sitting. Not doing anything, not even meditating..... because to meditate, from the back door the doing again comes in. Zen simply says, sit and don't do anything. Don't think in terms of doing, think in terms of being. Just be. So for years a seeker of Zen simply sits. It is the hardest thing in the world to do and I can feel you will understand it. It is the hardest thing in the world to do — just to sit. You would like something to do because that something keeps you preoccupied, and you go on feeling that you are doing something, that you are somebody. And at least it never gives you any opportunity to face yourself. Your doing is an escape from yourself, so that you never come face to face, so that you never encounter your own being".